The embattled co-chief executive of Airbus parent company EADS, Noel Forgeard, has resigned. The announcement comes after intense pressure on Mr Forgeard to quit in the wake of an insider trading scandal. Mr Forgeard, who denies wrongdoing, was accused of deliberately selling shares in EADS before the firm announced a delay to the Airbus A380 superjumbo. It was also announced that Airbus chief Gustav Humbert has resigned over the A380 delays. "The recently announced delay on the A380 production and delivery programme has been a major disappointment for our customers, our shareholders and our employees," said Mr Humbert. "As president and chief executive of Airbus, I must take responsibility for this setback and feel the right course of action is to offer my resignation to our shareholders." 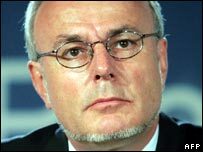 Mr Humbert, a German, is being succeeded by Christian Streiff, a former executive of French building materials group Saint-Gobain. 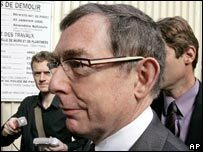 Mr Forgeard is being replaced by fellow Frenchman Louis Gallois, head of French state railway company SNCF. Co-chief executive of Airbus since last year, Mr Forgeard has continually denied any wrongdoing over his selling of EADS shares. He said he sold the shares in question in March of this year, and that he did not know of delays in the production of the A380 until April. When the delays were announced last month, Airbus's share price slumped 26%. Mr Forgeard's protestations of innocence were not enough to calm shareholder anger, and he has now paid the price. Yet he initially refused to stand down, telling a French parliamentary committee last week that such a move was "out of the question". Following the scandal, there were also calls for EADS to end its dual management structure. A Franco-German firm, it has two chief executives and two chairmen, one from each country. It looks as if this structure will continue. The delays to the A380 have been caused by wiring problems. EADS now says that only nine of the planes, instead of the previously expected 20 to 25 will be delivered next year. 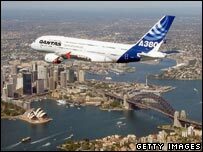 As a result, Airbus is to hold talks on compensation with those airlines who have already ordered the plane.